WARNING! Beware of touts and hustlers, operating in private cars. They illegally solicit from the kerbside, operating without public liability insurance and often in vehicles that are not even roadworthy. This picture is advertised on Jersey Lifts facebook page by a young man whose name we have removed off the side of the hackney taxi, the JTDA are very concerned that this type of misleading advertising is set out to deceive, as any person seeing this picture would actually think they are getting a licence Taxicab, but if this young person accepts a lift request and then charges a fare for proving that service he is actually breaking the law for touting and for being an illegal taxicab. Over the years we have seen a surge of unlicensed drivers who are usually young and inexperienced offering the same service as licensed taxis/cabs, they advertise their services usually on social network sites like 'Jersey Lifts' on Facebook or 'Jersey Lifts App' apparently these sites were originally set up as non-profit making car sharing services, the Police and insurance companies have said that it's not illegal as long as they don't make a profit from providing a lift. But now it is evident that these services go way beyond friends just offering each other lifts for petrol money, Drivers of all ages have seized the opportunity to make extra money through advertising on these sites and by touting illegally as a taxi/cab service. As the case when using any unregulated services the end user runs the risk of getting into an illegal and unlicensed taxi/cab and actually puts their lives in danger as many of these vehicles are not fit for purpose or checked for roadworthiness, the drivers have not been vetted by the Police (DBS checked) neither have they gone through any rigorous controls or training by the (DVS) Jersey's Drivers Vehicle Standards Department . The vast majority of them are not covered by Public Liability insurance for "hire and reward" i.e. taking paying passengers, so if you are unfortunate enough to have an accident you are not covered. 'Jersey Lifts' administrators on Facebook or 'Jersey lifts' App simply disclaim responsibility for the actions of their members. If the driver does manage to get you to where you want to go safely, you could still end up actually paying more than if you had used a legitimate licensed Taxi/cab that is covered by law which requires that all taxi cabs carry public liability insurance. It seems that in Jersey it will take an incident where people are seriously injured - or worse, before anything is done to stop this, any young person could end up being attacked or even raped as this 'Jersey lifts Facebook site' can easily be targeted by predators, most Facebook users on this site even provide their profiles and pictures for predators to look through...'Unbelievable when you consider what the consequences could be'. The JDTA say that action needs to be taken to change the law in Jersey, the JTDA are constantly reminding the police of the dangers of allowing this illegal service to continue, unfortunately the Jersey police say that their resources are limited and doesn't allow for continued surveillance, arrests for illegally touting as a taxi/cab service outside such places as Liberation station are extremely rare, yet their presence is obvious to any observer who will notice that the numbers are growing during weekend nights. In the UK fines of up to £5,000 are being imposed as a penalty by law for anyone caught touting illegally as a taxi/cab and our members feel that it's about time we started applying similar laws and fines here in Jersey. Legitimate licensed Taxi drivers are starting to question why they bothered going through such strict controls and tests by the licensing authorities at considerable expense, so they could apply for hire and abide by the laws while others flagrantly flout the laws, with no worries or cares about their passengers safety. They seem to feel that the laws that are there to protect the public don't apply to them as they answer to no regulatory body!. Pamela Anderson promotes "Ride Responsibly" campaign...The video, titled "The Signs", is Pamela's second PSA for the Ride Responsibly initiative, and comes on the heels of the #MeToo movement. The PSA is a stark reminder that even getting from point A to B carries risk, particularly if you are not conscientious of the service that you choose. Gary Buffo, President of the National Limousine Association (NLA). said: "The astounding number of tweets that referenced #MeToo and #uber was absolutely frightening, and disheartening to say the least...It is time to recognize that these services are simply unsafe, and pose an inherent threat to anyone using them, due to the blatantly insufficient background checks that Transportation Network Companies (TNCs) use. Our partner, PAVE, has been instrumental in our campaign to inform the public about the dangers these services pose. Together, we are actively working to compel safety measures that will prevent these crimes." Picture: JERSEY FIRE AND RESCUE...12TH May 2017. 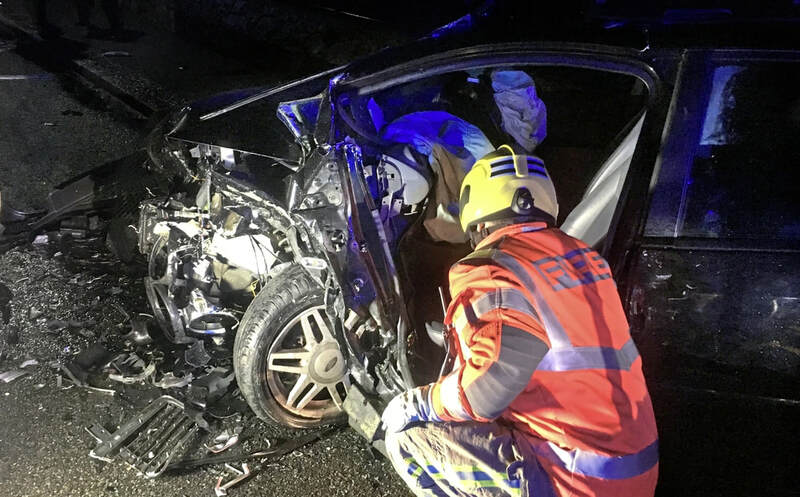 The court was also told that the young driver who had caused this serious collision had previously posted of his availability to give lifts on Facebook.